Crossing away each box on my table calendar. Looking forward to reach the box with number 19 in the month of December. Yup, that should be my last day of work before I go off on Christmas holiday (that is if my boss approve my leave. *finger crossed*). I am so excited that it’s November now. And that gives me a good reason to shop and spend. HE: Why are you buying this, Darling? ME: Oh, for the kids’ Christmas present! My Christmas gift list is getting longer each year as we have new addition in the family each year. Gifts for my Darling, Jonathan boy, my parents, 5 sisters, 7 BIL, 8 nieces, 3 nephews, MIL, 2 SIL, 1 SIL-to-be. One family needs to buy for almost 20 person and so I have 6 of us (my sisters & me) in the family, that makes 20 x 6 = 120 gifts. 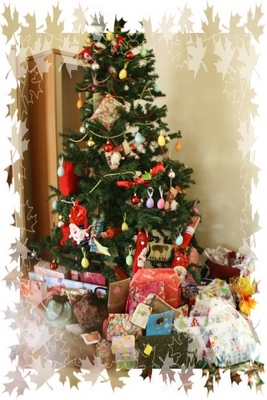 The foot of the Christmas tree will always overflow with lots of presents and some hanging on the tree. That was our 7 feet Christmas tree last year. That reminds me that I need to shop for a Christmas tree this year as I gave away my Christmas tree to my sis. I’m looking for a much bushier tree. I know there are names to different kinds of trees. I’m also thinking of a fiber optic tree. Any recommendation? This entry was posted on Tuesday, November 4th, 2008 at 8:30 pm and is filed under Family News. You can follow any responses to this entry through the RSS 2.0 feed. You can leave a response, or trackback from your own site. WOW! What wonderful big family christmases you have! definitely something to look forward to! WAH…..my Christmas is small. No Christmas tree and no big gatherings. I miss those…. oh..you remind me to take out my Christmas tree and do some decorations. *my pen fall down from my hand* Huge family you have. Pls share with us if you find any good deals on christmas tree/decorations. Waa… what a big family you’ve got! The tree full of pressies… so nice. wah… what huge family you have and 120 presents? we’ve been having christmas parties for the last 2 years for family and friends but still deciding about this year. with lyan fung around, i don’t know how i’m going to get things done. hmmm…. you’ve a wonderful xmas tree! it’s so big. nice and wow, with lots of pressies! if you do come to pg for xmas, do let me know! MC – Chistmas is always the biggest event for my family. Looking forward to it every year. HuiSia – Jo and Eli must be very happy to help in putting up the tree. Karen – Ok, but you are not in KL wor. Ryan’s mami – My parents have 6 daughters ler…huge and noisy family hor? Christine – With Lyan Fung around, Christmas is more meaningful. Can think of catering. Joanne – Start shopping around now. A big headache we’re gonna have in deciding what kind of Christmas tree to buy. Btw, got a tag for you, hope you have time for it. Nice Xmas tree…I also looking forward for Dec holiday. Looking forward for Xmas, too! Is true on what you have said Julie. I think I must start looking for the right X’mas tree next week when I go shopping.